Place a colander or fine-mesh strainer over a large bowl. Add the cucumbers and 1 teaspoon of the salt and toss to combine. Let sit at room temperature for 1 hour. Line a work surface with 1 layer of paper towels. Using your hands remove the cucumbers from the strainer and arrange them in a flat, even layer on the paper towels, top with another layer of paper towels, and gently press to absorb any moisture. Discard the liquid in the bowl and wipe it dry (no need to wash). Combine the sour cream, herbs, vinegar, pepper and remaining 1/2 teaspoon of salt in the bowl. 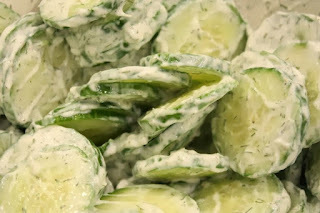 Add the cucumbers and stir to evenly coat. Serve immediately or refrigerate in an airtight container for up to 24 hours.